Such was the case during my recent trip to Miami, when Flaneur and I spent one afternoon walking around Key Biscayne along a quiet, empty stretch of beach on Cape Florida. We stopped at the Lighthouse Cafe, one of only two places to eat in the state park, and picked up a couple of fruit bars to enjoy in the warm weather. But because there was a minimum for credit card purchases (and I am perpetually cash-less), I added a small serving of fish ceviche to our order. Sitting on the cafe’s wooden deck while the breeze blew and the warm Florida sun beamed down on us, I couldn’t have wished to be anywhere else. 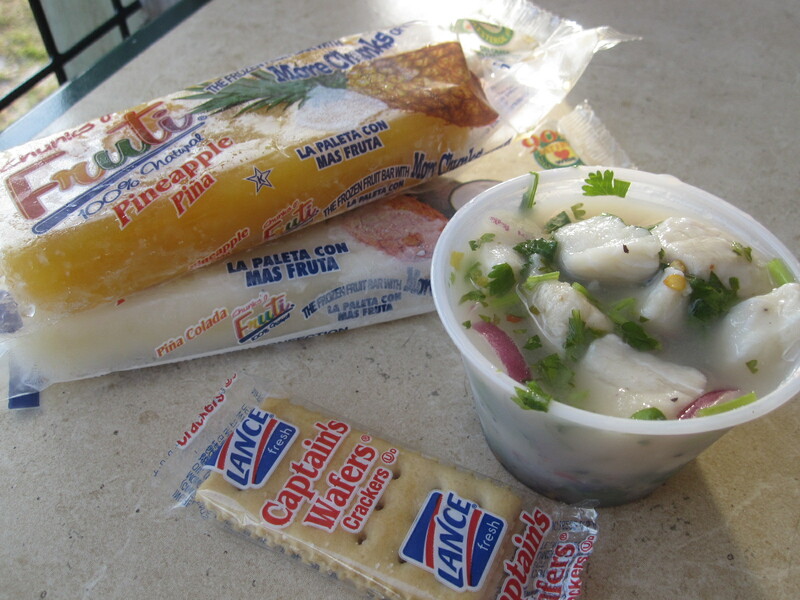 Cold, sweet fruit bars with hunks of pineapple and coconut followed by the zesty, juicy fish ceviche made for the absolute best snack I can recall having in a long time. Now as I sit looking out the window at the steely blue of a late, winter afternoon in New York, I can almost taste the warmth of that peppery fresh ceviche and the bright, colorful flavors of a piña colada fruit bar. Man, I wish I was there right now, having that again. This entry was posted in Uncategorized and tagged Cape Florida, ceviche, Key Biscayne, Lighthouse Cafe, Miami, pina colada, pineapple. Bookmark the permalink.